In a world filled with more buttons and drop down menus than insects in the rainforest, sometimes all you really want is a classic. Pop culture changes, fads pass by, but cool is forever. It trumps even the flashiest of fashions. Looking to keep it simple, the new TCX Heritage WP Boots are a full grain vintage leather construction with reinforcements at the toe and heel. 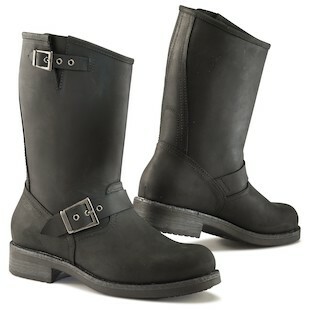 They have a durable, highly wear-resistant sole and are backed by the TCX proprietary waterproof lining. Externally, they look tough, and they are, but within you will also have the added benefits of TCX’s Comfort Fit System that will allow you to enjoy your time on two wheels even more. CE-certified for safety and styled with attitude, the Heritage Waterproof boots make their point without feeling the need to broadcast it to the world. 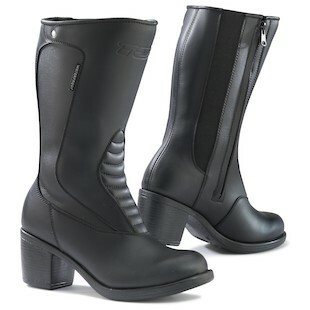 On the same side of the proverbial coin of style, the TCX Lady Classic WP Boots are a tail-kicking option for the female rider searching for moto footwear that is comfortable, functional, and not bathed in pink flowers. With a 2.3-inch rubberized heel, these boots not only show off a classic fashion sense, but they also help in a functional aspect by giving shorter riders the ability to better “flat foot” the ground on taller bikes. The extra-soft, full-grain leather is black on black with minimal TCX branding and few lines of interruption in its fluid design. So put away your bells and whistles, turn down the flashing lights and escape to a simpler time with the TCX Heritage and Lady Classic Waterproof boots.